Strawberry is based in one of the external classrooms on the ground floor. At the start of the academic year the children are aged approximately eighteen months to two years. 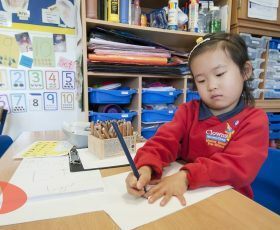 We work in line with the early years foundation stage curriculum and base all our learning experiences very much on the individual child and their areas of interest. 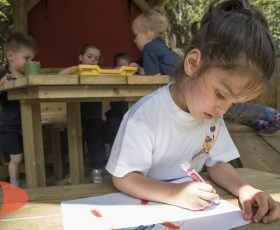 We believe it’s fundamental to work in partnership with parents and carers, in order to provide the best possible learning opportunities for each individual. Throughout the year we encourage the parents and carers to participate with their child’s learning journey. Be this through parental observations or sharing your expertise, culture or knowledge with us. Over the years we have had: parents and carers come in and teach us Bollywood dancing, to celebrate Diwali; parents dress up as Christmas characters to celebrate Christmas and also parents have read us stories about various cultural celebrations. We try our upmost to celebrate us as individuals and the diversity between us. Our theme on Occupations was very successful. The children really enjoyed learning about different jobs people do, for example teachers, the emergency services, postal workers and hairdressers. We linked our learning aims through activities such as art and crafts, small world toys, story time and the home corner, where we had a supermarket, a hairdresser’s salon and even an estate agency. Parental participation is always welcomed and this year a parent who is a vet came to visit us with equipment, storybook and a real puppy. Throughout the year we have different themes. These are led by the children and developed and extended upon, to help further link the children’s learning. A great example of this was the children’s love for animals so we created a farm, which we then developed into a farmers market. Where the children thought about what we buy, where our food comes from and where it grows. Exploration, excitement enjoyment and learning are the key to your child’s development and we are here to support them every step of the way.